Across the Universe by Enchanted Polish is one of the most difficult polishes to photograph and describe. It changed from copper to blue to purple, and has a holographic rainbow! 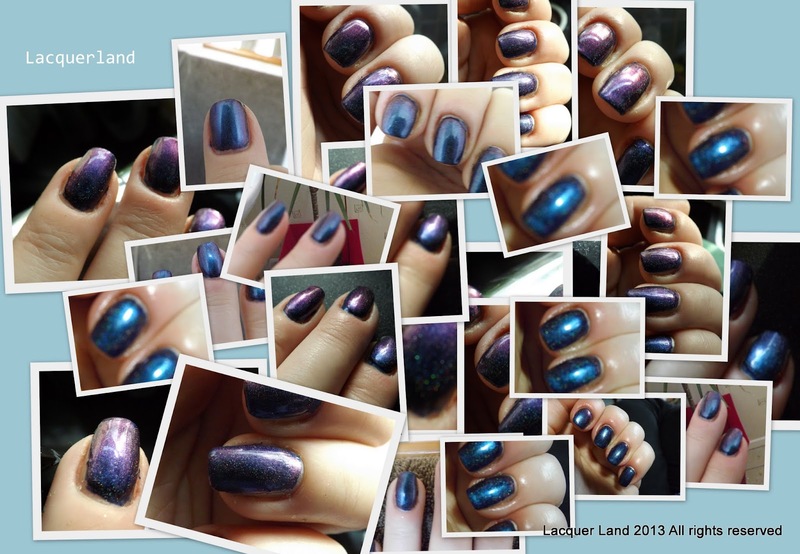 I have made a collage of all my photos in the hope it captures some of the aspects of this polish! Beautiful! Polish on a base of Barry M Navy with Leighton Denny Fast Finish topcoat. Leighton Denny 'Whatever' and Lynnderella 'Angel Food'. A very soft look today. Both polishes are a soft pink, the LD is a cream finish, applies smoothly in two coats. It dries well. Holding a random Lynn before sending to Sophie! Angel Food is a pale pink base, with square and hexagonal translucent glitters of various sizes. There is a pink micro glitter and slightly larger lilac and aqua holographic glitters that give a sparkle that catches the light and sparks different colours as the nail moves. This is one coat. I am not sure how it would look on its own but over a similar base colour just one coat is needed. Close ups, one blurred to show shine! Lush Lacquer Tropical Kisses and OPI Who the Shrek are you? Today I felt like having a complete change in colours! So looking through my stash I came across two minis that seem made for each other. OPI Who the Shrek are You and Lush Lacquer Tropical Kisses. Both colours are a similar lime green. The OPI has a lovely cream consistency and applies well. It was almost opaque in one coat. Two coats gave a smooth finish, no streak marks or bald patches. The Lush Lacquer is less opaque but covers reasonably well. This is one coat topped with one coat of INM Out the Door topcoat. It has glitters of red, pink and lime. There are are a few yellow larger glitters. The large glitters are quite sparse and tend to sink. This polish has been sitting in my drawer for months and it did need a shake. There are dozens of smaller lime glitters, these are not showing up well in my picture and only show on my nail in real life when the light catches them. These pictures are taken with no flash but under and artificial daylight type light source. Labels: Lush Lacquer Tropical Kisses, OPI Who the Shrek are you? Today I am wearing two polishes new to me. The base is Kiko 400, a gunmetal holographic that went to market during mid 2012 and Lynnderella 'The Present is a Gift', part of her Christmas 2012 collection. The Lynnderella is very typical of Lynn's work; a clear base chock full of zillions of shapes and colours. I can see black squares of two different sizes, aqua, lilacs, pale green and pink hex shapes. There may be silver there too or it could be the way the light is bouncing from the foil glitters. I'm sure there is a micro holographic sparkle. Kiko 400 is one of a set of four holographic polishes by Kiko. I have known of them for ages but never tried them. Tempted by sale prices (they are already reasonably priced) I bought some, mainly as I was involved with a swap and this was on a wishlist. It would have been unfair not to keep any for myself! The formula is perfect. Thick and paints easily. My pictures are of one coat with no topcoat. This is painted over my normal RCM gel but no other formal base. The holo effect is strong in normal internal light. When the artificial (or sun but we have no sun) light hits it, the effect is a strong rainbow of linear holoness! The Lynnderella brush came out of the bottle loaded with glitters. I might have preferred a sparser finish but this is fine! Just one coat with a quick dab here and there to place the black squares. A quick coat or two of Seche Vite and I'm all done! OK. Since I have been wearing polish every day, I have been fairly unconcerned about the state of my naked nails. They were hidden by some very pretty polish! To be honest, I feel polish has protected them. I certainly don't have the same issues with peeling nails and I think nail polish has acted as a barrier from water, knocks and scrapes. I have used oils, Vaseline and balms on my cuticles and they help. If I don't, the skin dries and cracks within days and it feels sore and looks worse. So it was with interest that I have been reading about the three day challenge by Anamarie from SimpleNailArtTips.com/oil. She has created a formula based on a jojoba oil blend that seems to work miracles. She sells her oil but also, and interestingly, gives the recipe freely! The science bit about why jojoba is explained on her web site. I have most of the ingredients at home as I like to make my own oil blends, so I decided to take up the challenge using my own concoction based on Anamarie's recipe. I had become concerned at the condition and appearance of my naked nails and as I have already said, I need to moisturise my cuticles constantly! The hardest part of the challenge is going naked for three whole days. That is 72 hours! You can read about the how and why at SimpleNailArtTips.com but in a nutshell I have applied oil to my nail plate and cuticle several times for three days. For the first 48 hours, for me, this meant three times an hour. My nails were drinking the stuff. After almost 48 hours to the dot, the rate of absorption began to slow and I had to apply oil less often. Today, the 72 hours is over. My nails look better and feel fantastic, smooth, glossy and not oily in any way. The cracked nail on my little finger feels smoother and the nail bruises (the white marks) have not vanished. The white of my free edge seems whiter and the staining from months of nail polish is much improved. To conclude, the jojoba based oil treatment gets a massive seal of approval from me. Information about jojoba and Anamarie's blend of oil is available at www.SimpleNailArtTips.com/Oil"
If you are reading, then you are welcome to comment and feedback is always appreciated. I am not a nail technician, or a photographer! Nor do I claim to have fantastic nails. I simply own some fabulous polishes! Not many words today, I have a cold and a sinus headache! My cuticles and nails are not feeling well either so not looking at their best. China Glaze Tree Hugger is the base colour on my nails today. It has a wonderful texture, goes on like a dream and dries quickly. Everything we have come to expect from this brand. The colour is not as vibrant as I expected, almost a fresh pea green. There is a shimmer to this polish, the particles being so tiny they are almost impossible to see. An excellent polish in every respect especially as I bought it for £2 brand new in a sale. Vermelho polish is from Brazil. They are super sparkly and full of glitters. They are quite thick, and maybe it will need some drops of thinners soon. It applied well but I had to take care to make sure it was even all over my nail. It dried reasonably quickly for a such a full glittery polish. The glitter is a mix of greens, blues and yellows. It has a good scattered holographic effect. At first I used Vermelho Prince Frog as a ring finger accent. After two coats of Inm Out the Door it was smooth and fairly glossy. It is a thirsty glitter though and perhaps a coat of a glitter specific topcoat such as Lynnderella Glitter Tamer or Nail Polish Boldness Glitter Food would have given better results with one coat? Removal is quite easy for such a dense glitter. I bought these from Marcia Lima. They are reasonably priced at $6 but shipping from Brazil to the UK is shocking. They took about 10 days to arrive. Sadly one polish didn't survive the journey. It was impractical to ship just one to replace it but Marcia did refund me for the polish. Just for fun a little while later, I painted Ninja Polish No Peeking over the polish. You can see the Prince Frog sparkle through. Although this is a Christmas colour, I think it is fine for any day of the year! You can see the star on my nail. The Ninja polish is full of gold holographic stars. I had three stars on the other ring finger but I can't take steady photos on that hand! 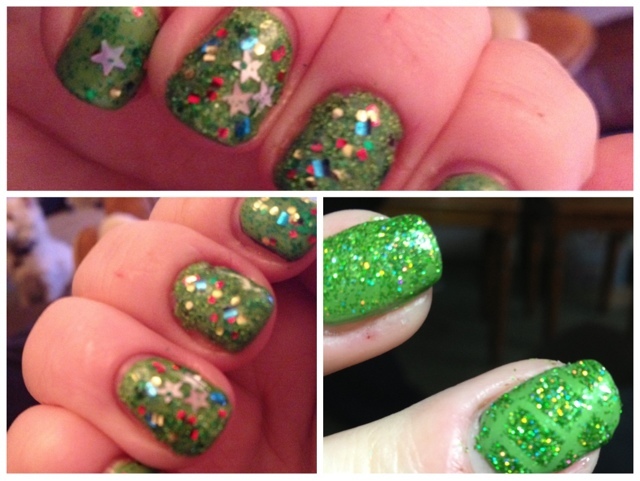 It is absolutely crammed full of green glitter in a clear base, with some red, light blue and gold square glitters. Like gifts hidden in the tree. Perhaps that's why it has the name 'No Peeking'. Vermelho is available from Marcia Lima., email: marcialima2608@yahoo.com.br. Today I ask myself the question, how many purple holographic polishes does anyone need? I have lost all of the photos in this post. I have a collage of the images I had used so please look at this! 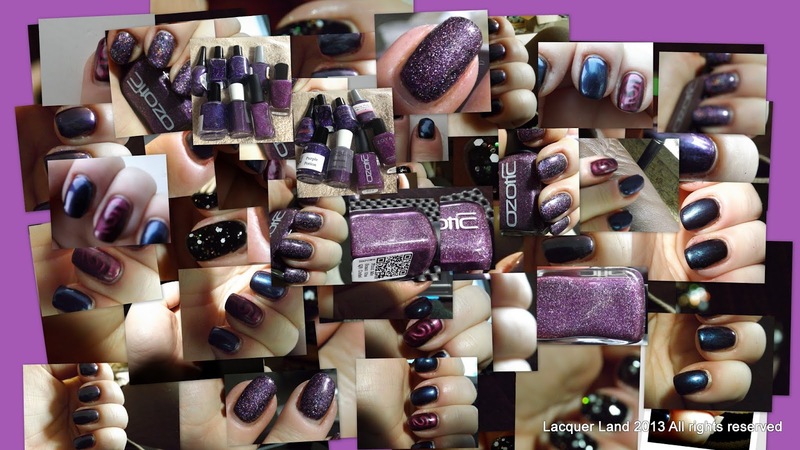 Ozotic 624 is the one I chose to wear. It is a dense polish, I imagine a fairly coarse grade of holographic powder has been used. The purple is rich and leans towards red in my opinion. It has a more scattered holo effect than linear, but the holo is so strong that there is a hint of a linear quality to it too. It applies very easily and smoothly.These pictures have no top coat and there is still a gloss. It is applied over a Red Carpet Manicure black gel polish. It covers the black adequately with one coat and an extra coat of Ozotic gives no clue that there is a black polish underneath. There is no grittiness to this polish at all. First, a view from my front garden the day before yesterday. It was an unusual and lovely sunset, all bright and hazy. I doubt the photo captures the true magnificence ... but sunsets in January are infrequent where I live. I guess they happen everyday... but I rarely see them as it is too cloudy, or too murky or whatever. So today I have chosen 2 colours to layer over the RCM black gel I am wearing. There is a thin coat of OPI Nothin' Mousie about it over the black but the only evidence of this is the heart shape left on my nails. I didn't want to scrub the OPI off so the shimmery base went but the hearts remained. They were tricky enough to locate and place so I am not surprised that they were reluctant to be removed! Here are the two polishes I have chosen today. China Glaze Frostbite, a vibrant blue with a shimmer that seems to glow from within, darker and richer than the bottle picture shows. Lynnderella, Bride of Franken, is my other choice to wear over the China Glaze. Bride of Franken is a violet base, full of holographic dust particles and round blue/violet glitters. Two shades of the same thing! I have two bottles of Bride of Franken this and I think it is fair to say they are definite variations on the same theme. One is much lighter than the other, almost a baby pink. I guess that is the thing with smaller brands where the polish is made in tiny batches and also it illustrates that when buying from others, it is impossible to know the life story of the bottle! The following are un-special pictures of the effect on my hands. The paint job doesn't really hold up to close scrutiny today! I like the colour of both polishes and both the micro holographic dust and the larder glitters show up in real life, especially as the light hits them. Application of both were great, the China Glaze is strong enough to glow over the black base and for the colour to hold its own in two coats. The Lynnderella was simply painted on, no difficult application, glitter chasing or dabbing needed. Slightly blurry to capture the round glitters... fail! You can see the left over heart from the OPI polish. The holographic dust showing up here but not the round blue/violet glitters. If you are reading, then you are welcome to comment and feedback is always appreciated. I am not a nail technician nor do I claim to have fantastic nails. I simply own some fabulous polishes!